Even with all the poops, burps, and feeding I deal with everyday, I sure love being mom! When people ask me how I am now and how's motherhood treating me, prepare for a loooong monologue. I love talking about mommyhood and my baby #CamillaClaudette (yes, she has a hashtag! Hahaha!). But I won't bore you with all the details. I'm here to talk about this really fine brand that I got to know over sumptuous lunch at Society Lounge just last week. SwaddleDesigns finally launched here in the philippines and made many flourishing online shops its home. Now, not only A-List celebrities (by the likes of Angelina Jolie and Gwyneth Paltrow) get to enjoy what SwaddleDesigns has to offer, us too! But let's talk about swaddling first! Swaddling was a lifesaver! It is! If you're a new mom, pregnant or just contemplating about having a baby, swaddling is one of the things that you need to master and you'll have easier time taking care of your bundle of joy. Believe me, this is definitely one of the reason why I barely had late nights with Claud. Why? Swaddling imitates the comforting feel and warmth of a mother's womb. Naturally, babies are not use to the open space after being so well taken care in a dark warm womb, the bright lights and coldness of our surrounding is just too much for them. These cause them to be fussy, with you ending up with sleepless nights trying to calm your baby. Babies also have involuntary reflexes that cause them to wake up easily from their nap. Swaddling them and securing them in a soft blanket limits these reflexes and allows them to sleep much longer. And since we can't be there all the time for our baby, learning this comforting technique will be invaluable to you. I know it was for me. More importantly, Swaddling is also one of the best way to avoid SIDS (Sudden Infant Death Syndrome), for it limits the chances of babies to move around and finding themselves in the tummy position that sometimes causes suffocation. It's amazing how swaddling saves your child's life, too! SwaddleDesigns came in to resolve issues of limitation of really good swadddling blankets in the market. I have to admit that I came across problems of finding really good swaddling cloths. Blankets are either too big or too small (mostly small) and it did not have the right thickness that I wanted for our weather and lifestyle. "It (SwaddleDesigns) was designed with mother and child in mind," shared Joy Sy-Sim. She's the official distributor of SwaddleDesigns. She's the preggy lady in the purple dress found in the photos below. "And we believe that caring for your baby is all about embracing every moment and embracing the lifestyle of living in a modern world. 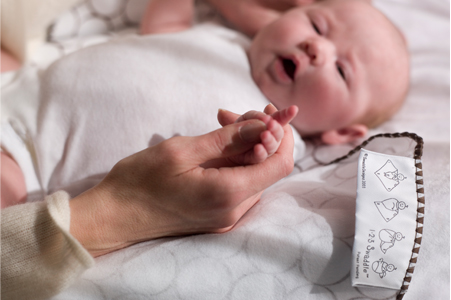 Products like Swaddle Designs are helping each parent embrace that moment. ", Joy added. All of which I completely agree with. Swaddles really are just huge square cloth, but SwaddleDesigns catered to moms like me who is looking far more than just a piece of clothing. For us who wants something extra special for her child, SwaddleDesigns has us covered. Truth be told, Swaddling wraps are the first ever product that we purchased for our baby Claud. It helped us ease into becoming parents because we wanted her to always be secured. SwaddleDesigns are one-stop-shop for everything you need to keep your baby secure, snug and stylish. They have wide array of swaddling blankets of different designs, thickness, cloth and what nots. Their designs by far are what I think suits the modern moms best. Joy wanted to interact with her guest so she challenged some of us in a little bit of swaddling contest. It's been awhile since I last swaddled Claud but I was up for it! I wanted to try out SwaddleDesigns and thought this to be the best opportunity. Thankfully, I was still good at it! Yey! Not great but still, I was able to wrap this cute doll properly. And oh! I didn't have to think back on how to swaddle before because SwaddleDesigns blankets come with an an easy 1-2-3 instruction! Yey! There was also a fashion catwalk to showcase how moms can make use of the products under SwaddleDesigns, showing us, too that moms can be fashionable! Yes, all the models are mommies like me! :) So pretty, noh? And then we had another game! It's how to maximize the use of swaddle cloths! I partnered up with Rina's Rainbow and weturned the SwaddleDesigns marquisette cloth into an origami skirt to cover spit up and other boo-boo's babies might cause. Some of the guests turned the cloth in hair bands and hair pieces which are quite ingenious, too! And for the much awaited part of the blog, here are the products available here from SwaddleDesigns! These are the Ultimate Swaddle Blankets and it's incredibly soft. A must-have for every baby. And the more the better. We currently have about 20 blanket and I find myself wanting more. I think it's time for me to collect SwaddleDesigns. And ain't the designs just beautiful? Marquisette Swaddle Blankets are my favorite because of the thin and light texture that makes this ideal for all sorts of use. It can be a swaddle, blanket, stroller cover and also as a nursing cover! It can also be a changing blanket in case you don't have any. I'm quite taken with SwaddleDesigns and their take on swaddling and luxury and quality fabrics for our love ones. And there is an accomplishment in learning the right way to swaddle. So don't get scared or daunted. It's part of motherhood and one of the best part, I must say! For more information, visit swaddledesignsph.blogspot.com. Visit also their facebook page for updates. You can get SwaddleDesigns at Cudsly.com!